It is no longer uncommon for taxpayers to live and work in different metropolitan areas and for organizations to hold meetings and conventions in resort locations. When this is the case, some or all of the taxpayer’s travel and lodging expenses may be deductible. Tax professionals need to be aware of the myriad of rules surrounding the deductibility of travel expenses in order to adequately advise their clients. This course explores the requirements and limits pertaining to deductions for travel and lodging expenses. The general requirements are set forth in detail, with specific attention given to travel and lodging related to temporary work locations and foreign travel. The concept of a taxpayer’s “tax home” is illustrated using numerous examples and explanations. Deduction of travel expenses for medical, charitable, and educational purposes is also addressed. Identify non-deductible commuting expenses from the costs of deductible travel. Determine when spousal or companion travel may be deductible. Identify how to handle the travel expenses of taxpayers with multiple work locations. Recognize when travel expenses have to be allocated between business and non-business activities. Recognize the limitation on deductions for lavish or extravagant travel expenditures. 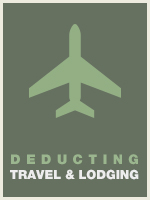 Differentiate deductible from nondeductible lodging expenses.